The success of a website does not come from its aesthetically designed web page or from its beautifully crafted content, not even from its wireframing, set of color palette, animations, media, or from its responsive design. So, where it all comes then? Have you heard of user experience? If not, then maybe that’s the main reason why you are here reading this article. A lot of developers and designers make the crucial mistakes of developing a website that only works for them rather than a website that works for the customer. They forget about the user experience, which certainly the most important aspect when developing a website. To improve the usability of a website, developers, as well as designers, need to understand how people are using it and how they interact with it. Or in other words, they need to understand the experiences of users on their website, hence user experience. As a developer and designer, you can not achieve that by relying on manual testing. Fortunately, there are tools available that could help you test and evaluate the user experience on your website. And for this post, we have listed 13 tools that could just do the job more effectively. UserTesting brags itself as “the fastest way to get feedback” as it generates results in 1 hour by recruiting participants to test your site. Just let the software know what tasks you want the user to perform, and UserTesting will take it from there. 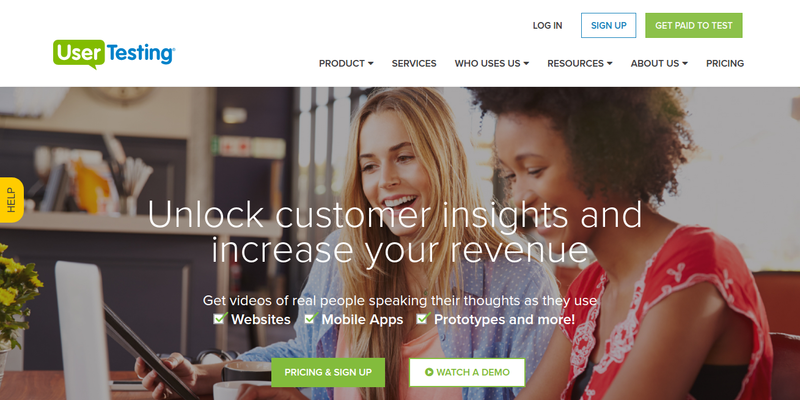 UserTesting also offers an online service that provides a recording of real users giving their thoughts and commentaries whilst interacting with your website or app. It offers a wide variety of services, from assisting you in identifying your customer’s demographics, selecting user profiles that you would like to conduct a survey, to setting up any type of user testing you wish to do. They even offer a service where you can see real-time video of test participants using your site or app. Once the testing is complete, UserTesting will provide you a full report about the overall user experience of real users along with recommendations and suggestions for your site or app’s improvement. You also have an option where you can view the testers activities navigating throughout your site. Getting feedback from real people does not need to be so difficult. With Usabilla, you can get feedback with no hassle. Usabilla focuses on getting visual user feedback, providing your site with some feedback feature that allows site visitors to answer questions by placing points and notes on top of your design. This will give an option to select and compare clicks, and allows you to analyze their comments within their visual context. Usabilla also offers some of the amazing user experience evaluation features, such as click heat maps, exit surveys, mobile feedback, targeted feedback forms, and feedback widgets that collect feedback from users via email. You can also create feedback forms, record activity of visitors, test your forms, and get live feedback by communication with your visitors. It also has a “slide out” poll that focuses on collecting emotional rating and feedback. All the data gathered by this tool can be viewed with graphs and reports all within the Usabilla dashboard. They have monthly and annual pricing plans, but each user can try it out for a 14-day trial. User’s first impression also matters in the user experience which why Attensee evaluates where users look and focused on your site. As a result, you can measure the effectiveness of your site and discover new ways to improve it. Attensee integrated features like heat maps, track user’s behavior, and indicates where an area of your site (CTAs, ads, or forms) grabs more attention and where’s left unnoticed. You can also perform split test variations on design to find out the optimal placement, color, and sizes. Optimizely is a well-known A/B testing platform which allows you to track site visits, conversations and click testing without having to spend a lot of time coding. This tool makes it easy for you evaluate user experience as they offer a lot of features, including cross-browser testing, mobile website testing, geotargeting, visitor segmentation, and multivariate testing. You can also schedule the user testing so you would not have to worry about missing out a day without site evaluation or remembering to run a test. Optimizely also allows you to personalize your website and mobile app for additional improvements. Optimizely supports different platform and can be used for desktop, mobile browsers, web browsers, and mobile apps. Usability Tools is a comprehensive testing platform with 9 different tools, each you could purchase separately. Each tool allows you to perform different tests of the aspects of user experience, including navigation ease, design feedback, A/B testing, evaluation of your forms and buttons, and record your visitor activity to determine hot spots, bounce trends, and so much more. All the tools are divided into two groups. The first one consist of survey, card sorting, a simple feedback box and unmoderated, scenario-based testing. 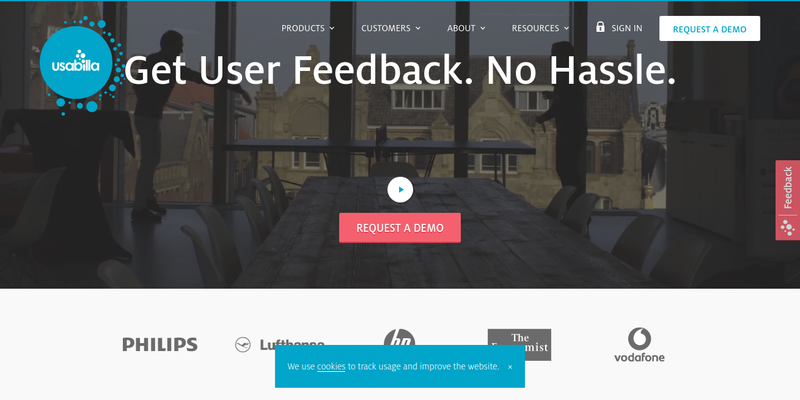 These tools enable you to reach your users directly and receive feedback from them. The second group consists of click-tracking heat maps, A/B testing, visitor recording, and form tester. These tools allow analyzing users’ behavior. Usability Tools also integrates a research panel, called CINT that allows you to run a proper market research with an access to over 10 million respondents worldwide. 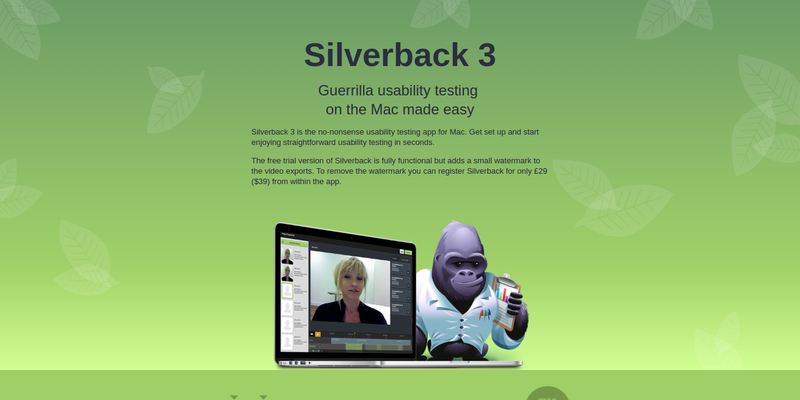 Silverback is a Mac-based usability testing software and one of the most favorite amongst designers and developers, as this tool is a great option for those who need a program in their office and on the go, replacing the more traditional and more expensive tools. This tool allows you to record screen activity such as mouse click, mouse scroll, mouse movement, key presses and key strokes. Analyze, edit, and play back usability testing sessions. It also records not only user’s activities but also their user’s facial reactions and audio. Silverback is more effective on Mac OS as this tool makes use of hardware that is already present in your Mac device. Silverback costs $49.95, and a portion of the proceeds go to Gorilla conservation. That’s very kind of them. CrazyEgg is a click-based user experience tool and one of the best tools for finding out why your users leave your site. This tool tracks the user clicks via visual heat maps that identify which object on your website are being clicked and where users mostly interact with your site (and where they’re not). The scroll mapping feature allows you to see how far down each user has typically scrolled. The Confetti report of CrazyEgg is also an important feature. It offers you a great insight regarding search terms, visitor sources, and who is clicking what. It also has an Overlay feature that will break down the number of clicks per page element. With CrazyEgg, you can also discover “false bottoms” in your design, know where buttons are prominent enough, compare clicks before and after tweaks, perform A/B testing, see which banner ads get more clicks, and a lot more. CrazyEgg only cost between $9 and $99 per month. But, they offer a free 30-day trial. 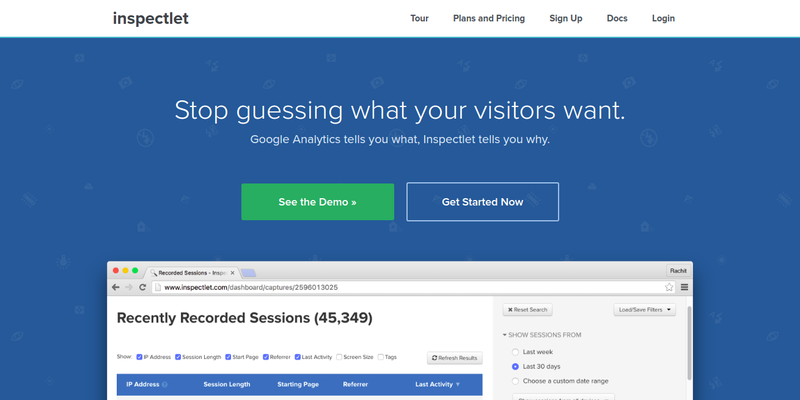 Inspectlet is a visual tracking software that records all your site visitors activities. You can watch users as they browse through your site, see where they click, pause and read the content, and monitor their mouse movement, scrolling, and key presses on your site. This will help you determine what attracts attention, what causes confusion and when visitors leave the website. Inspectlet also has eye tracking heat map features that allow you to see where users mostly interact in your site. It also tracks your website’s social-buzz, page-load time, scroll depth and gives you full report through real-time analytics and custom metrics. Inspectlet also integrates form analytics tool that highlights which part of your website is the most troublesome for visitors and where they are failing the most. Making it one of the best tools to use when you want to change things up and improve the usability of your website. Loop 11 is a quite unique online tool for evaluating user’s experience. It uses a scenario based test to improve the usability of your website and allows for unmoderated remote usability testing utilizing real users. For example, a researcher will provide a simple task for a user, and then tracks their overall interaction. The data gathered will be sent through a report that contains the completion rate of users on every task, the common fail pages committed by them, time spent by users on each task, and a comprehensive path analysis for every user. The results presented by this tool are pretty accurate. There is also no need to load the software on to the website, making it faster and convenient. You can also benchmark against your competitors to see what they are up to and see how your website compares. Loop 11 can be purchased for a flat fee of $350, ideal for those who need to do a lot of tests, but may not fair for those who only need to test a few. Clicktale is more than just a click map, it is also a paid hosted service that will track the keystrokes, key presses, and mouse clicks and mouse moves of users, as well as the time it takes for them to navigate the website. Each user has a browsing session that is being recorded and saved. You can watch a video playback of users as they experience your site. They now also integrated side-by-side heat maps that will show the hot zones where the user spends most of their time and cold zones where the least amount of time is spent. The side-by-side heat maps also enhance insights into A/B testing and provide a better understanding of the user’s behavior. By also using a side-by-side comparison, it will be easier to spot glitches between different browsers or mobile devices. The only downside of this tool is that it is not capable of capturing the reason of user regarding the actions that they did or did not take. The pricing is a little bit of confusing too, you can subscribe with this tool via monthly, semi-annual, or yearly, and ranges from free to $790. TryMyUI is one of the best tools for remote usability testing, as they offer simple solutions for improving your website like you can watch videos of real people using your website just like Inspectlet and Loop 11, and see what they like about your website and what they find confusing. Evaluating user experience also made a lot easier with TryMyUI. You can just tell the software what task you want the user to perform on your site, what type of users you want in performing the tasks (demographic), and how many users you want to perform. TryMyUI will then take it from there, leveraging all its tools to collect feedbacks and will provide you a narrated video of each user navigating your site. Other features of TryMyUI includes mobile testing, mouse clicks, keystrokes, video screen caps, and a system usability questionnaire, all available for a competitive price of $35 per month. They offer discounts for those who would like to invest in bulk. 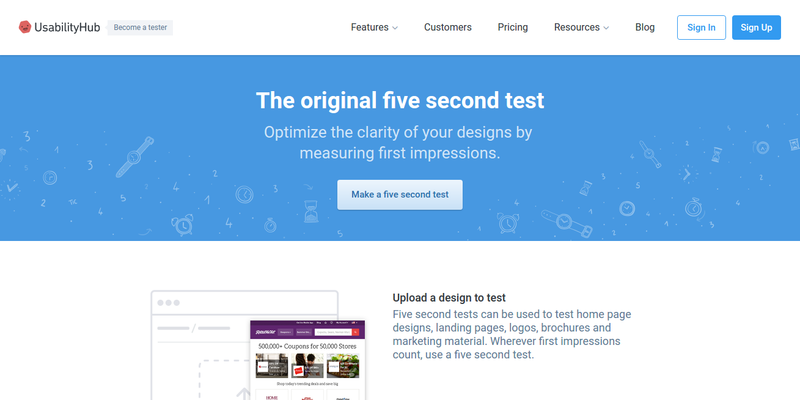 Five Second Test is a usability testing software operated by UsabilityHub. It is designed to help you understand peoples’ first impressions of your landing page and website designs by taking a snapshot of their first impression. It lives up to its name, as it only takes 5 seconds to run a test and the process is really simple which only includes three steps. First, you have to upload a screenshot or mockup of the page (uploading a mock up is advisable) including the question about the functionality or design. Next, each tester will have 5 seconds to look at the page, prior to answering the questions given. Lastly, Five Second Test, along with UsabilityHub’s team will then compare the responses. That’s it, you will have all the data presented to you. You can also use Five Second Test before the whole testing process to tailor your wireframes and ensure that your message is being communicated effectively. The pricing plans for this software start at $20 per month. However, you can earn free responses when you complete tests for other users.